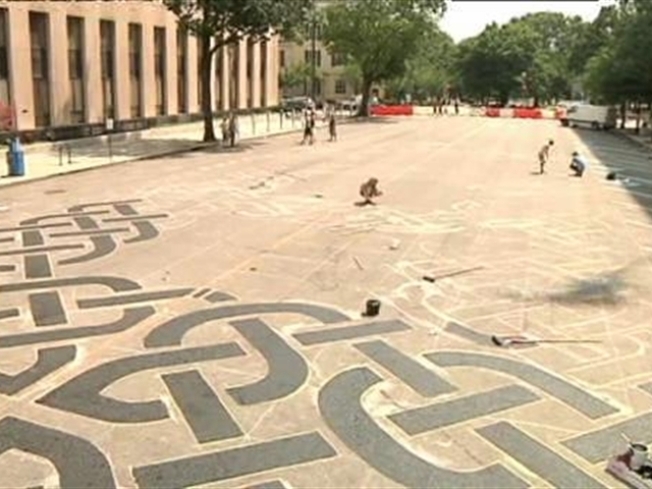 Road Tattoo Completed in D.C.
An artist designed and painted a road tattoo to honor the soldiers who lost their lives while serving their country in Iraq and Afghanistan. Over the weekend, artist Steed Taylor outlined his tattoo design on the 800 block of Vermont Avenue NW, about two blocks from the White House. Volunteers helped him paint the design. The D.C. Commission on the Arts and Humanities selected Taylor to create the road tattoo. He has made similar tattoos on streets in at least 30 cities across the country.